Return the function from another function. Assign function into an array. Include in any data structure. Function are an instance of an object. Function can have the properties. In this example, we can see whether if the condition is satisfied or not, since I asked if that function is having an instance of the objects or not. This was very interesting for me, that the function can have properties and function. It can link back to its constructor function. You can pass a function as parameter to another function. 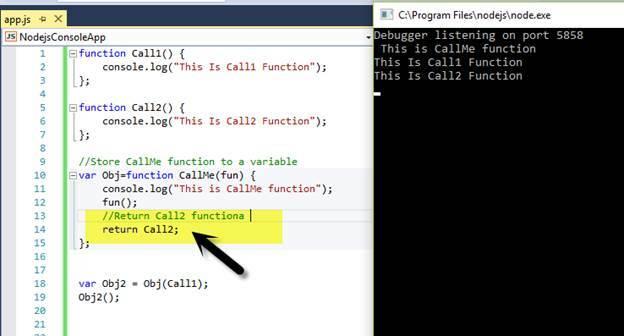 In the example, mentioned above, we created Call1, Call2 and CallMe function, followed by passing Call1 and Call2 as the parameters of CallMe function. We can assign any function to a variable. We can return a function from another function just like any other object integer or string. You can assign a function to any array just like an integer or a string. 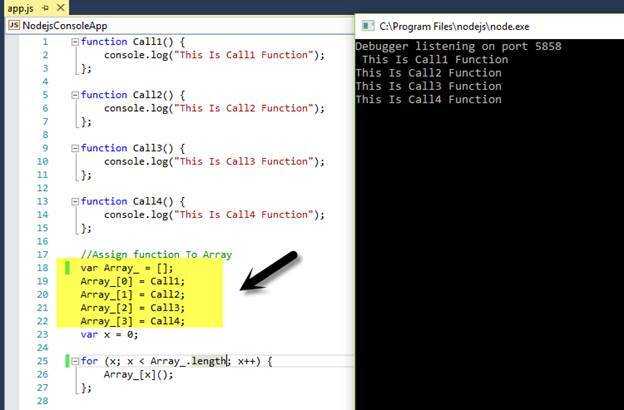 In this example, we assign four functions to an array and call each function, using the index of an array. I think this is the most useful property of a function, where we can use a function in the partial Applications. In the previous example, we understood, that we can return a function from another function. Let’s take another example. Partial Application is used to return a function, which is not complete and require some user input to compute the result. In this example, we create Add function, which takes an input and returns a function. As we passed 10 as a parameter, this value is stored in the function, which is returned from Add function and next time, when we pass 20 and 10, which are already stored and is added with 20; 30 is returned as an output. 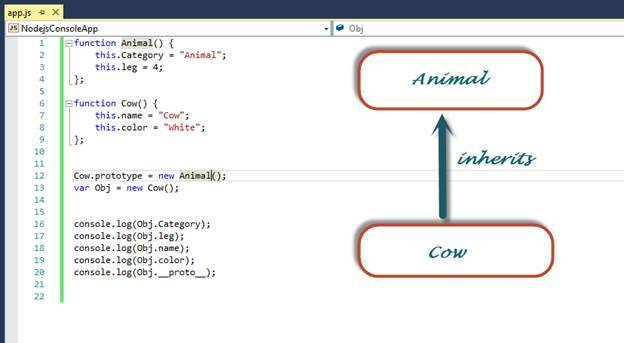 In this example, we create two function constructors“Animal” and “Cow”. In the prototype of “Cow”, we assign the “Animal” object, which means __proto__ link of Cow object link to the Animal object. 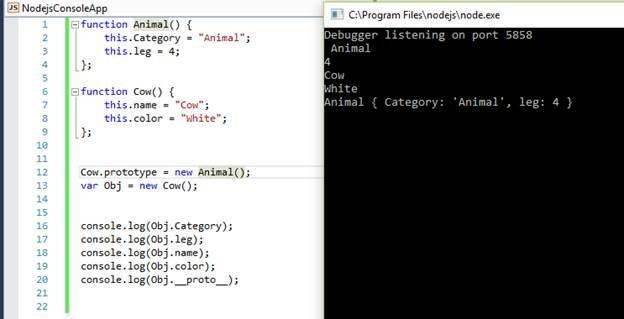 When we try to access the “leg” and “Category” property, using the object of Cow, the interpreter doesn’t find it in Cow, it searches in __proto__ link, where it found the Category and leg property. We can see that __proto__ property of Cow link to the Animal object. This is an example of prototype inheritance. This is an example of prototype chain, where a prototype of an object inherits another object and this object is also assigned to the prototype property of another object. 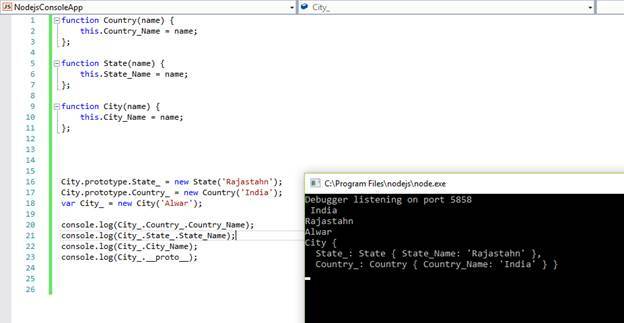 When an interpreter searches for Country_Name, first of all, it searches in object of City, when it doesn’t find it, it goes to __Proto__ property and finds a link to State object, it searches for Country_Name in the state object and when again, it doesn’t find the Country_Name, it again goes to __proto__ property of the State object and finds a link to the Country Object, where it finds the Country_Name. Interpreter searches in __proto__ property, until it doesn’t find __proto__ as NULL. 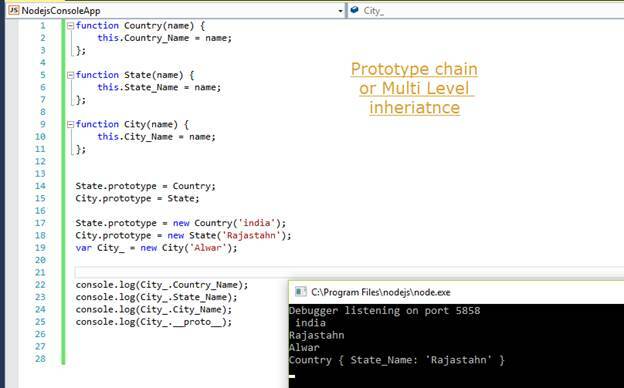 In this example, we create State_ and Country_ property for __proto__ and assign the prototype of the Country object to Country_ and the prototype of the State object to State_. When you check the prototype of the City object, you find that it contains the definition of both Country and State objects.